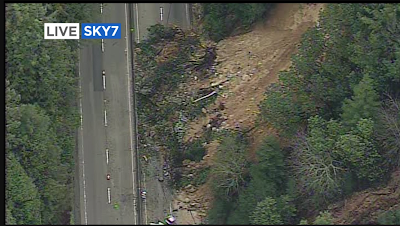 Here is a photograph of the slide that has blocked the eastbound lanes of Interstate 80 in California. That last I heard, the road was still closed in both directions. This is another case of weather science providing days of notice of a highly disruptive storm in Northern California and those forecasts helping to mitigate the destructive effects of that storm. Now, I'm starting to work on the change in upper atmospheric weather pattern and a possible winter storm in the nation's mid-section this weekend. Stay tuned.